Build a database of credit card customer emails and email database of non credit card customers. 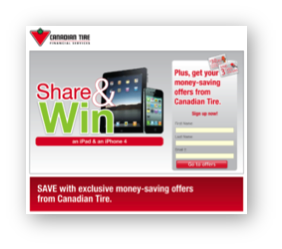 Canadian Tire Share & Win campaign, an example of Social Lift & Social Media Influencers at work! Influencer recommended a micro-site with access to store coupons, a contest with extra entries for sharing. Social Lift is key to the success of any social media campaign. Social Lift is free traffic that a campaign receives from entrants sharing the contest with friends and family. This sharing is FREE for the campaign, because there was no advertising involved in that share and subsequent new entry into the campaign. Top Influencer brought 2,120 new emails alone! Social Media Influencers are powerful for every campaign. Social media influencers are the people who are your brand advocates. These people share your campaigns to their network of followers, therefore increasing the Social Lift on your campaign, and disseminating your brand message to multiple people. A survey conducted by Nielsen Global Online Consumer Survey of over 25,000 Internet consumers from 50 countries, found that 90% trusted recommendations from people the know, and 70% trust consumer opinions posted online.